The Jamocha Almond Fudge is the answer to your chocolate fudge dreams. 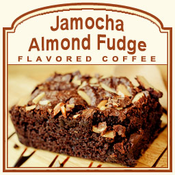 If you like buttery almond slivers, hints of mocha, a splash of Jamaican rum, and a full body of chocolate fudge flavor � look no further than this Jamocha Almond Fudge flavored coffee. Delicious and warm, this coffee will make your taste buds melt into a heavenly oblivion. If you want 100% Arabica beans, 2 calories in each cup, and a full body of flavor, this Jamocha Almond Fudge will be quite the indulgent treat. A heat-sealed valve bag will ensure the freshest coffee possible � which is why we roast and ship this Jamocha Almond Fudge on the same day. 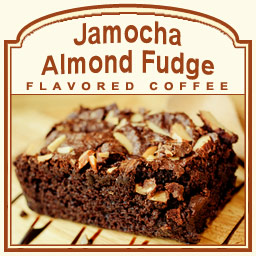 Delicious and warm in flavor for those that love a full-bodied flavor, this Jamocha Almond Fudge features an ultimate mocha-inspired flavor with just the right amount of almonds intertwined into each and every sip. Mmm � truly decadent and delicious!